A SPACECRAFT DOES NOT FLY LIKE AN AIRCRAFT ! A spacecraft navigates in three dimensional space in weightlessness. There is no top or bottom, and no aerodynamic lift. Therefore, a spacecraft can fly to any direction desired and it continues flying even without propulsion, because there is no drag. When the engine produces a force, the spacecraft accelerates and could theoretically reach unlimited speed. But for that it would need unlimited fuel and a lot of time. The implementation of a course change is completely different compared to an aircraft. On the picture beside, you can see that the attitude is changed first by small thrusters at the sides of the craft. Then, the main engine is fired for some time. 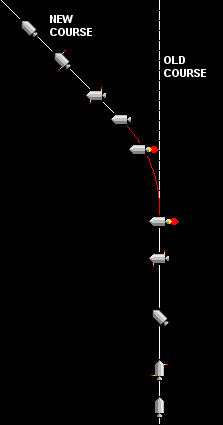 During this period, only, the course is changed (red line). After termination of main engine burn, the spacecraft is rotated back to an attitude parallel to the new course. 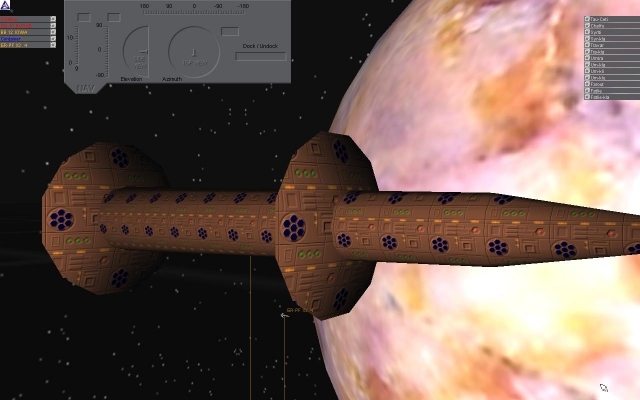 So, the next game will have 3D spacecraft moving in 3D space as described above. This is all what is told today, and if you really want to see this game showing up, you better not simply copy SPACEBALL for a good friend, because writing a good game is a lot of work which is not done when you earn nothing with it.